Table Mountain has been officially inaugurated as one of the new 7 Wonders of the Natural World!! 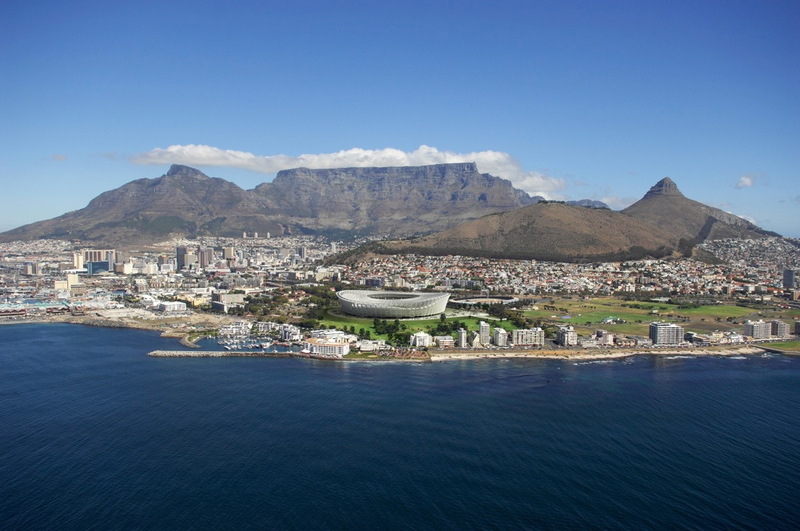 Table Mountain dominates the Cape Town city skyline at 1084.6 m high (3558 ft), and can be seen as far as 200 kilometres out to sea. The 1st recorded ascent of the mountain was in 1503 by Antonio de Saldanha. The main feature of the mountain (where its name was of course also derived from) is the approx 3km level plateau (from side to side), which is edged by impressive cliffs. This “cloth” normally appears when the south-easterly wind blows, and legend has it that it is a result of a smoking competition between the Devil and a local pirate called Van Hunks. The competition is said to be afoot when the cloud appears…! The Tugela Falls in KwaZulu Natal, is the second highest waterfall in the world, at 948m (3110ft)! The Mpumalanga Province is home to the Blyderiver Canyon , the third largest canyon in the world – and the largest green one. The Grand Canyon in the U.S. is the biggest, and the Fish River Canyon in Namibia the second, but both are very dry. Kimberley’s famous ‘Big Hole’ is the largest hand-dug hole in the world and is deeper than Table Mountain is high. Famous for its once incredible diamond deposits, it yielded 2720kg of diamonds, or 13’600’000 cts! Today it is a proud part and reminder of our country’s diamond heritage. Kimberley also has the only drive-in pub in the world. Close to Oudtshoorn are the Cango Caves, a 3 km long sequence of caverns of glittering stalagmites and stalactites, which makes it one of the longest underground cave sequences in the world. The Boesmansgat is renowned as the second deepest sinkhole (about 299 metres) and the largest of its kind in the world. As you can see our country truly has much to offer! Remember to come back next month for the next part in our series!